Mike Minor didn't think about Saturday's significance until his parents texted him after the game. Minor walked two of his first three batters. 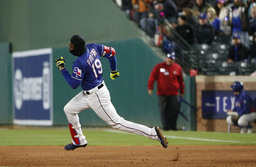 Yangervis Solarte then hit into a double play started by Profar, who played third base in place of Adrian Beltre - Banister said the 39-year-old Beltre in part because of the cold.